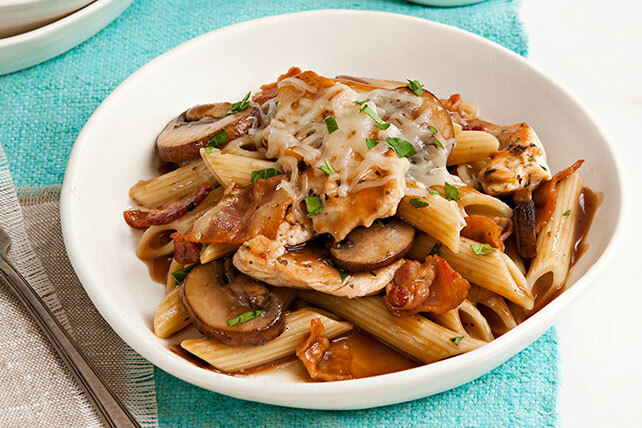 Mix up your weeknight with our easy Chicken and Mushroom Pasta recipe. Our Chicken and Mushroom Pasta is served in a delicious and savory sauce. Cook and stir bacon in large skillet on medium heat until crisp. Remove bacon from skillet with slotted spoon; drain on paper towels. Discard all but 1 Tbsp. drippings; reserve half in skillet. Set remaining reserved drippings aside for later use. Add chicken to reserved drippings in skillet; sprinkle with Italian seasoning. Cook 5 min. or until chicken is evenly browned, stirring occasionally. Remove from skillet. Heat remaining drippings in skillet. Add mushrooms; cook and stir 2 min. Return chicken and bacon to skillet along with the broth mixture and 1/4 cup parsley; cook 10 min. or until chicken is done and sauce is thickened, stirring frequently. Meanwhile, cook pasta as directed on package, omitting salt. Drain pasta. Add to ingredients in skillet; cook and stir 1 min. Top with cheese and remaining parsley. You can use button, cremini or portobello mushrooms in this pasta dish. Add 1 cup arugula or baby spinach to chicken mixture in skillet before adding the drained cooked pasta; cook and stir 1 min. or just until greens start to wilt. Add drained pasta; continue as directed. Sprinkle with 1/2 tsp. crushed red pepper before serving.